Kurt Allison with Jason Aldean. 24mm with the Nikon 24-70mm f/2.8E VR, Nikon D850. Choosing lenses for any genre of photography is important, but this is especially true when you up against constraints. If you're a music photographer, you know that time, access, and lighting are things that are very often well beyond your control. For this reason, choosing the right gear for your needs can be a critical task. Here's a rundown of the best lenses to use for live music photography, including my favorites as well as some more unusual choices. 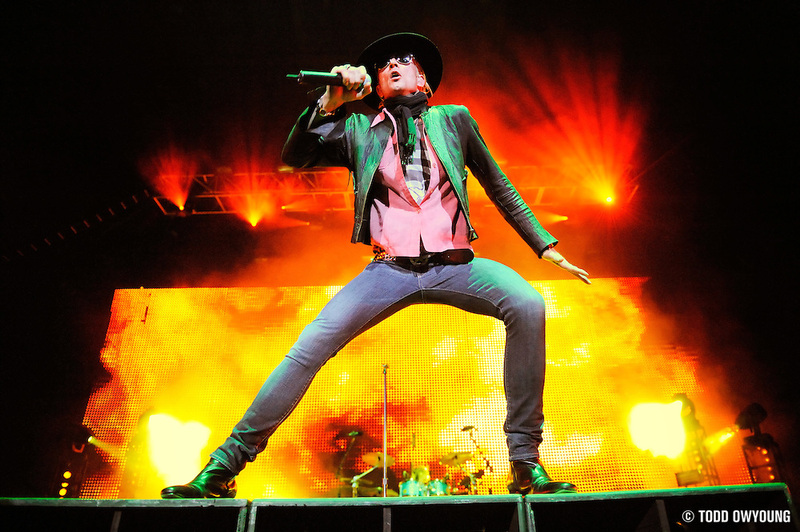 Scott Weiland of Stone Temple Pilots, photographed at Verizon Wireless Amphitheater in St. Louis. 24mm with the Nikon 24-70mm f/2.8. The eternal debate: Prime vs zoom lenses. 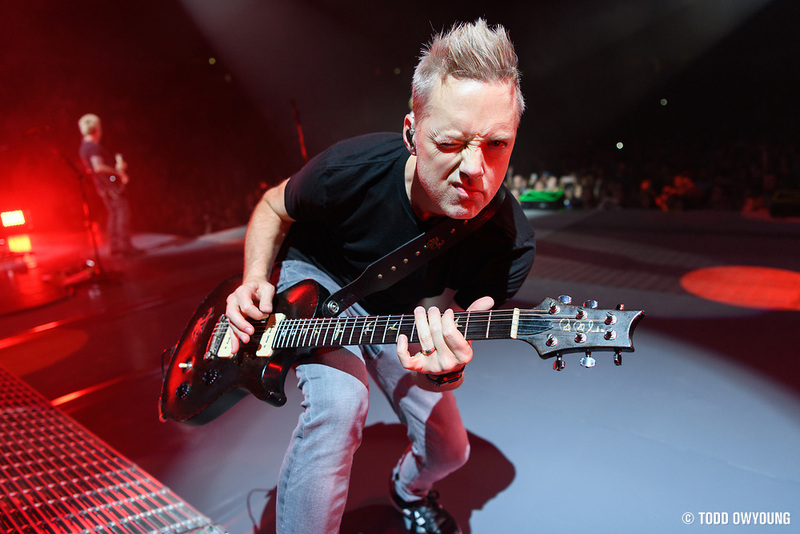 For concert photography, the answer to this question depends on the type of events one covers. For my work, which is primarily photographing larger venues (say, theater shows and larger), I vasty prefer f/2.8 zooms. The reason is simple: the flexibility that zoom lenses provide is indispensable for covering events such as live music, where one's position is often severely restricted. If you are shooting press and only have access to the photo pit, a zoom will give you the greatest ability to vary your compositions and create compelling images. If you are photographing smaller shows without a photo pit, where you may be covering from a fixed position in the crowd or otherwise have limited ability to move, the ability to vary your frame easily will be an even larger boon. The two exceptions to this recommendation are for very dimly shows or speciality lenses. For very small clubs where lighting may be especially dim, the 2-stop difference of a f/1.4 prime and a f/2.8 zoom can make a huge impact in one's images. All things being equal, that 2-stop difference can mean shooting at a 4x faster shutter speed or an ISO setting 1/4 that of what you'd need with the zoom. Even the 1 and 2/3 stop difference with a f/1.8 lens can be a massive help in low light. Beyond purely utilitarian benefits, fast primes can also help create images with a much different look than an f/2.8 lens. This is particularly true with shooting shallow depth of field images — think shooting behind a performer with a 35mm f/1.4 wide open with an arena filled with upheld cell phones with the lights on. More on fast primes later. The other exception of preferring zooms to primes is with with specialty lenses. For live music, this means super telephoto lenses (lenses 300mm or longer) or fisheye lenses. Here, primes will offer the best speed (no surprise) in the highest performance. The tradeoff for zoom versions of these specialty lenses will often be slower than f/2.8 — more commonly f/4 or even slower, which can negate the flexibility of a zoom optic. I'll go more into these specialty lenses below. 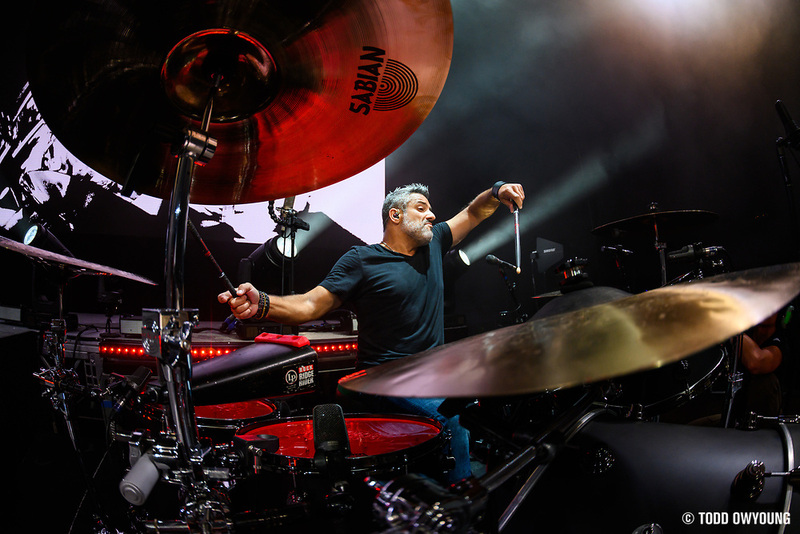 Rich Redmond with Jason Aldean, photographed at Shoreline Amphitheater in Mountainview, CA. 15mm with the Nikon 8-15mm f/3.5-4.5. As you may notice, I've provided the lens information for all example images in this article. For all images made with zoom lenses, all are made at the extremes of the zoom range. This is not a coincidence — it's quite common to hit up against the minimum and maximums of a zoom lens. This isn't to say that I shoot exclusively at the extremes, it's simply a natural extension of using equipments with limits. I'm often asked which lens I would recommend for live music photography, and a 24-70mm f/2.8 is always my first choice if budget allows. The sheer versatility of this range is the very reason that it's a standard. My go-to lens is my Nikon 24-70mm f/2.8E VR. 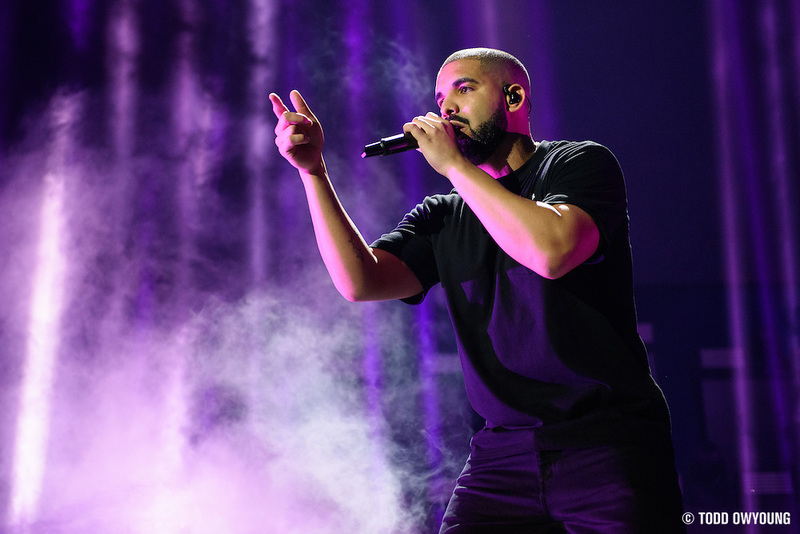 Drake photographed at the iHeartRadio Music Festival in Las Vegas. 70mm f/2.8 with the Nikon 24-70mm f/2.8. For me, this is my bread and butter lens. A 24-70mm lens offers fantastic versatility, offering you a wide angle to short telephoto, and everything in between. If pressed, one could very easily cover a whole concert with just the 24-70mm focal length and create a variety of different types of imagery (with the caveat of not working well for say, a soundboard shoot). 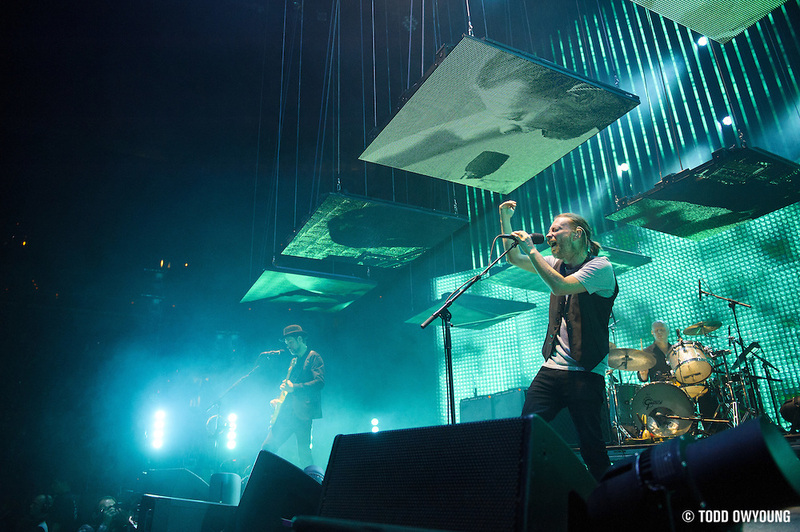 Radiohead photographed at the Scottrade Center in St. Louis. 24mm with Nikon 24-70mm f/2.8. The f/2.8 aperture, especially for relatively short focal lengths covered in this range, is fast enough to give you reasonable shutter speeds, especially with the excellent high ISO performance of just about any modern APS-C or full-frame camera. If there's one lens to buy when you're just starting out as a music photographer, the 24-70mm f/2.8 is my vote. Basically every single manufacturer makes one, not to mention third-party choices that may be more budget friendly. For those who shoot large events exclusively, a lens like a 24-105mm f/4 or 24-120mm f/4 may be an option as well. I know several photographers who use this lens over a 24-70mm f/2.8, but these photographers shoot large, well-lit concerts almost exclusively. Ultimately, the choice comes down to range and lighter weight vs light gathering ability and optical quality. Right after the midrange zoom, the 70-200mm f/2.8 is a workhorse for the music photographer. This telephoto range is especially useful for tighter framing of individual performers, whether it's a headshot of a singer or closing the distance to the drummer at the back of the stage. The isolation and reach of a 70-200mm f/2.8 combine to produce images that can feel dramatically different than a 24-70mm lens. For this reason, the 70-200mm f/2.8 is the second recommendation I'd make as you're building your kit. As you photograph larger shows, lenses like the 70-200mm f/2.8 become more indispensable, simply because with larger venues, the distance increases between photographers and performers. This can be especially true at larger music festivals, with feature very tall stages that might but performers 15-25 feet away from your lens (or more). 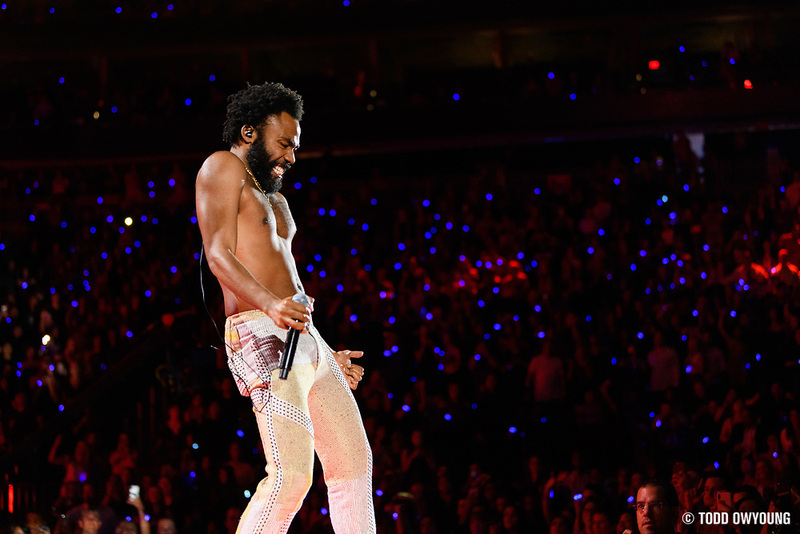 Childish Gambino photographed at the iHeartRadio Music Festival in Las Vegas. 70mm with the Nikon 70-200mm f/2.8E VR. In addition, the longer focal range that a 70-200mm grants frees up the concert photographer to explore different angles and treatments. 200mm can give one the freedom to shoot for farther back, which can give produce a more flattering angle for artists. Next up, I'd recommend a 14-24mm f/2.8. For me, this ultra-wide range completes my “holy trinity” of lenses. For me, the ultra-wide zoom in one of those “nice to have” lenses that may only be used 5-10% of the time, but which creates images full of impact and for which there often is no substitute. Justin Tranter of Semi Precious Weapons, photographed at Pop's in Sauget, IL. 14mm with the Nikon 14-24mm f/2.8. I love using a 14-24mm lens for showing the scale of a show through venue or atmosphere shots, but also for getting in extremely close to performers to dramatically play with perspective and scale. For me, a lens like a 14-24mm is a lens that is “wrong” most of the time, but when it's right, it's so right that it will have you looking for opportunities to use this unique perspective. 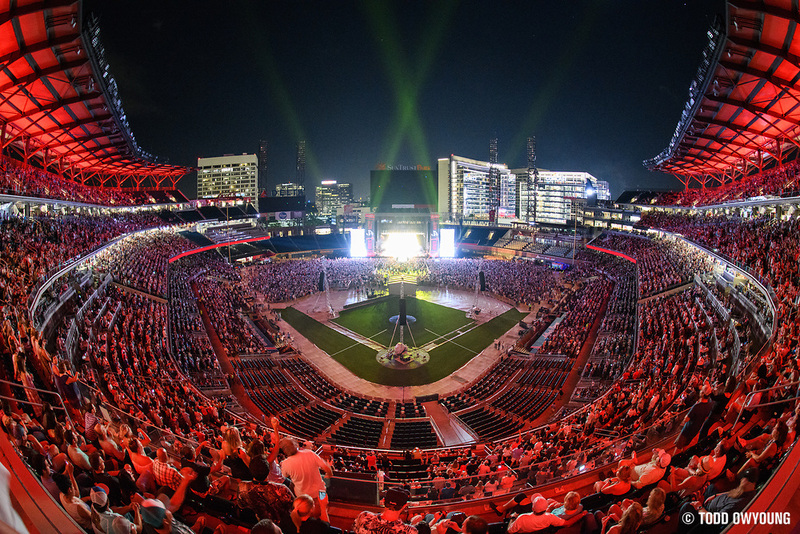 Jason Aldean at SunTrust Park in Atlanta, GA. 15mm with the Nikon 8-15mm f/3.5-4.5. While I prefer zoom lenses for their flexibility, sometimes nothing beats a fast prime lens. For those who shoot smaller shows or venues that are more dimly lit, I would recommend including a 35mm f/1.8 or 50mm f/1.8 in your kit. The right focal length will depend on the type of venues you're working. 35mm for smaller venues may be best, while those shooting with taller stages may benefit more from a 50mm. Overall, I'd say that the f/1.8 versions in these focal lengths are fast enough to provide a big benefit, while the cost savings over a f/1.4 lens makes these lenses a much more budget-friendly option. Even an f/1.8 lens will provide 1 and 2/3 stop improvement. This can be a huge benefit if you're struggling for a reasonable shutter speed and you're already at the limits of comfort in terms of ISO setting. There have been countless shows I've covered where having a fast prime in the bag has been the difference between working with ease, or struggling with frustrating lighting. A fisheye lens may cover the same focal length as an ultra-wide rectilinear lens, but it does so in a dramatically different fashion. This effect is one that I love using for very large shows, just like a 14-24mm. However, the effect is different enough that I like the option of both for my clients. In some instances, a rectilinear look is better, and for others, a fisheye lens can produce an incomparable effect. In this role, I've been using the Nikon 8-15mm f/3.5-4.5 fisheye, which is ridiculously sharp and compact. 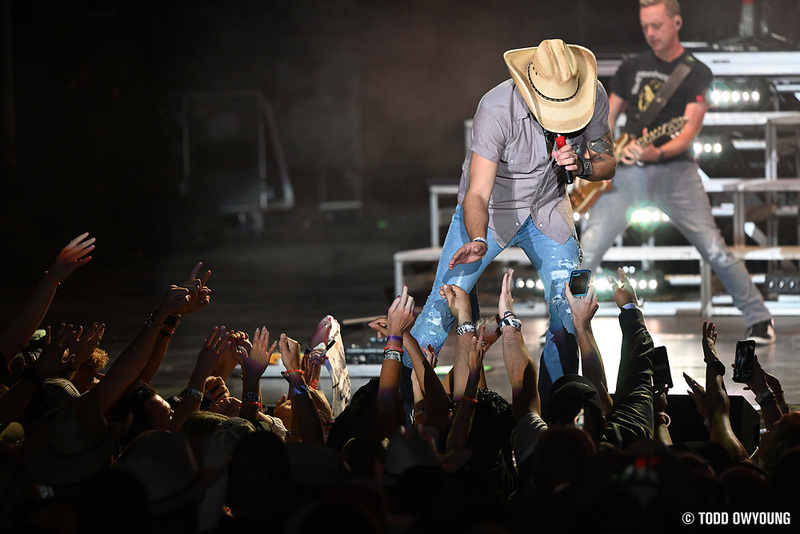 Jason Aldean photographed at Shoreline Amphitheater in Mountainview, CA. Nikon 300mm f/4. For distance shoots like covering an event from the soundboard or crowd, I have grown to love my Nikon 300mm f/4. A lens of this classification is light, compact, and will offer just enough reach over a 200mm to justify its place in my bag if I know that I will need to close the distance between myself and my subject. For a much less expensive option, a 1.4x teleconverter will give you an excellent ability to get close to 300mm when paired with a 70-200mm f/2.8. So, what's in my kit for live music photography? In addition, I'm shooting with the Nikon 24-70mm f/4 Z Nikkor as well as the Nikon 35mm f/1.8 and 50mm f/1.8 Z Nikkors for my Nikon Z 7 bodies. If you're going to have one lens for music photography, a 24-70mm f/2.8 is what I would recommend above all other choices. It's the best balance of speed, range, and quality that you'll find, and every manufacturer makes a professional lens of this spec. You can get by with other lenses or slower zooms, but for most professional event photographers, a constant aperture zoom like the 24-70mm is king. From there, I'd buy a 70-200mm f/2.8. For most shooters, you can have just these two lenses and call it a day, and they will serve you for any medium to large scale venue, short of soundboard shoots. With a midrange zoom and 70-200mm, you can cover nearly anything that comes your way as a music photographer. Beyond that, it's all down to speciality lenses — ultra-wide, fisheye, and super telephoto. These lenses are the “nice to have” pieces of kit. But while not strictly necessary, they can help create images that help set you apart.